This pass is a demonstration, that popular cycling passes do not necessarily have to be the steepest, or lead through the most vertical and surrealistic rock scenery known to cyclists. In spite of the fact of its relatively high elevation, Port de Canto is quite the opposite. Maybe it's this special position that makes out its charm. It is a smooth, modern road, but with little traffic, along a big breadloaf in the sky, overlooking what looks like a big green paradise from up here. From East. 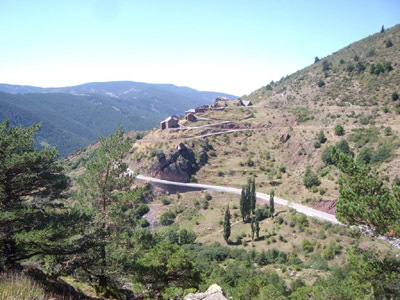 The profile starts in Adrall in the valley of the Rio Segre. But I actually didn't get onto the route until point 2, after coming down from Pic d'Orri. At this point the road makes a big detour to the south, by contouring along a big gentle forested nose of a landform, the Serrat de Carla. The climbing is relentless, and there are only two minor additional switchbacks to take your mind off the road. It is such a workout, that the viewpoint at point 3, is a great break, and a scenic relief too. This is the best scenery view along the way, in my opinion. To the south and west lies a big gentle forested valley dominated by pillow like landforms. Only if snow adorns the higher ridges, do they take on a foreshortened harder look. After relaxing a while and then leaving this remote parking lot view point, I am wondering if this was not actually the summit. While the profile shows the road climbing gently from here, in truth the road does sometimes go downhill for short sections along this long gentle traverse, that seems like it goes along a forested breadloaf in the sky. The pass itself is very apparent. as I approach it in a straight line, a gentle gap between two rounded knolls. From West. There are few hill settlements on this side, but mostly the villages are more modern vacation businesses. There are one or two exceptons, and one of them looks quite spectacular, the village Tornafort at almost 1300 meters height. located on the other side of a wide valley. I can see from the pictures on Panoramio, that many others have been impressed by this view as much as me, and that they had better light than I did. The descend into Sort is the final celebration of the day. A total of 4 big switchbacks are connected by long curving ramps, that are a fast roll. I stop many times and enjoy the various vantage points on Sort. The mountains behind the town reach 2676meter: Pico de Llena, and 2894m, Pico del Paso.